Thick black plastic sheets are an effective natural method for killing grass. The thick plastic will kill the grass through high temperatures during the summer season. Plastic applied to lawns in late fall or early spring will heat the soil to prematurely germinate unwanted weed and lawn grass seeds. According to Ohio State University, tarping or covering the lawn with black plastic in summer heat can be used to kill the grass in a lawn without the use of herbicides. Moisten the lawn area, with the garden hose and sprinkler, that is to be treated by the black plastic sheet. Heat is transferred better in moist soils than in dry soil. According to Clemson University, the soil under the black plastic sheeting should be checked throughout the summer season to confirm a high moisture content. Spread the black plastic sheeting over the area of grass that is to be killed by the heat of the sun. Hold down the edges of the plastic using rocks or bricks. Winds will tend to lift the edges of the plastic, which will reduce the effectiveness of the natural heat accumulating under the non-porous material. Lay the rocks or bricks every 12 inches to 18 inches apart from each other to hold down the edges. Lay old boards across the interior of the plastic to hold the material down next to the soil. The boards can be randomly scattered across the plastic, just as long as the plastic remains in contact with the soil and grass. Keep the plastic in place during the summer. Monitor the progress of the grass by checking under the plastic periodically. Various species of grass and weeds will take different lengths of time to be killed by the heat. 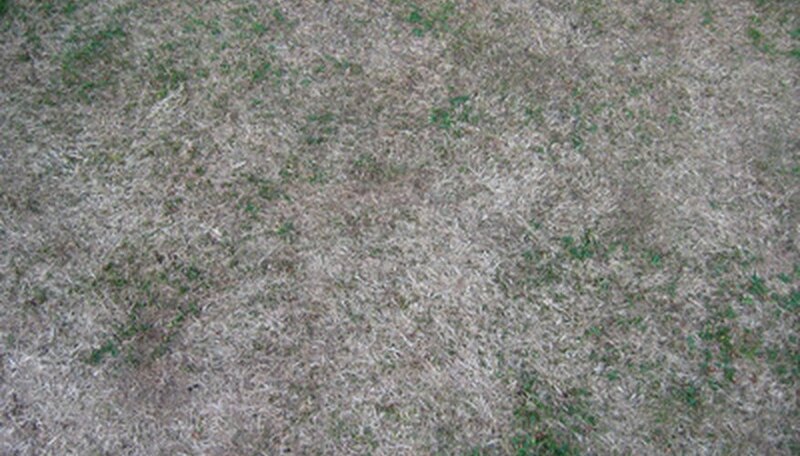 Generally, when no signs of yellow to green growth are observed, and only dried brown growth remains, chances are all of the grass is dead. Using clear plastic will heat the soils, but still allow light to pass through to the plants below. While clear plastic may be used to prematurely germinate warm-weather seeds, it may not effectively kill grass. Black plastic is rated in mils. The higher the mil number, the thicker the plastic. A 5-mil plastic is 0.005 inches thick.